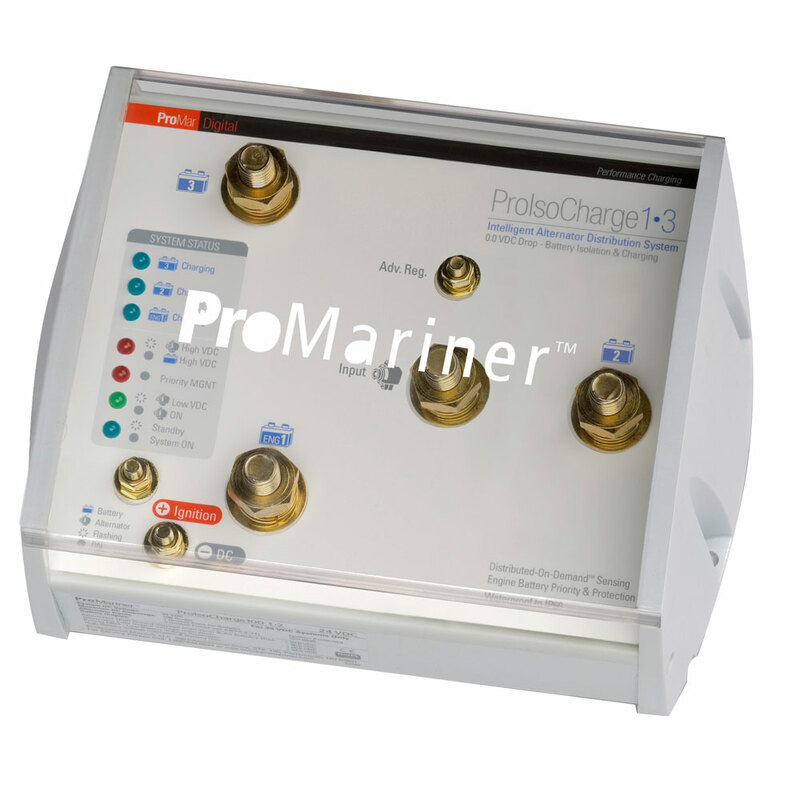 ProIsoCharge delivers digitally controlled alternator output distribution while protecting the health of engine start batteries. An industry changing design that provides intelligent and zero voltage loss isolation, charging of up to 3 other battery banks off a single alternator (model specific). For dual engine applications, ProIsoCharge offers an exclusive 2 alternator input model with up to 4 battery banks. Smart enough to provide priority charging to a battery bank that's under load by taking fully charged batteries off line. The all-in-one design eliminates the need for multiple voltage sensitive relays to charge multiple battery banks simultaneously, saving space, installation time and cost. Ensuring fully charged batteries and faster charge times, ProIsocharge eliminates the typical alternator voltage loss of 0.6VDC that's commonly associated with traditional diode based isolators. Installed with the ProNauticP Series, a boat owner can enjoy the full benefit of shore power and on the water charging. Designed to provide more time on the water enjoying what you like most... boating. All digital design delivers active battery status and automatic engine battery healthpriority while digitally distributing the full output of your engine's alternators. ProIsoCharge's intelligent software control provides priority charging to a battery bank thatis under load (i.e house bank or power inverter bank) by taking fully charged batteries off lineand priority charging discharged battery banks, while insuring the health of the engine batteries.